The first half of this book was a bit of a tough slog, and were it not for the fact that I had it on excellent authority that I was in for a treat, I would have been tempted to give up. The pace picked up considerably at the start of section 3, though. This book has a little bit of everything to please an array of tastes. There are unsavory, disreputable characters (which Dickens did so well), the ridiculous and self-important who are worthy of nothing but contempt, and kind and honorable characters. There is mystery, murder, greed, romance, jealousy, betrayal, and it is all topped off with a thoroughly satisfying ending. I chose this particular edition over the myriad of others that are available because it included an introduction by Nick Hornby, whose books I love. Sadly, I could have done without Mr. Hornby's introduction. After disparaging many contemporary writers (and there are many out there who may feel rightly so, but I don't feel the was the appropriate forum to voice this opinion), he then went on to state, ". 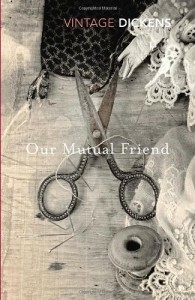 . . it is only fair to warn you that Our Mutual Friend - his last completed novel - is in the opinion of many, including this writer, far from his best." Perhaps the publishers should have looked a little harder to find someone who actually likes and respects the novel to write an introduction, rather than go with a popular writer who clearly does not. Also included in this edition was a list of characters and some charming illustrations. I don't know if the list of characters is standard in all editions, but I found it invaluable as I read the first half of the book. Trying to keep track of something like two dozen principal characters while trying to follow the story would have been near impossible for me without this tool. So let me sum up my rating: 5 stars for the work by Dickens, and 1 star for the introduction by Nick Hornby.